'Cliffhanger' ending at Pistorius trial Jump to media player A South African judge has found that Oscar Pistorius was "negligent" in his actions when he shot and killed his girlfriend Reeva Steenkamp, but has yet to give a verdict. 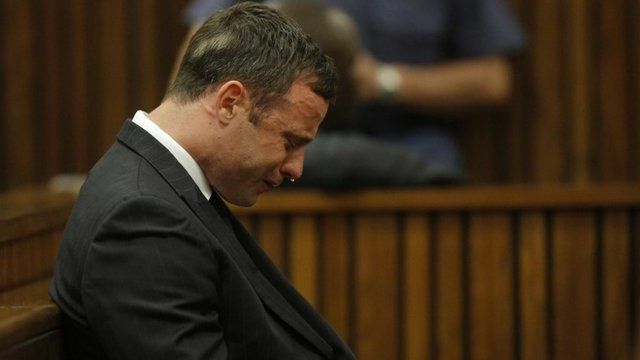 Pistorius weeps as court returns Jump to media player South African Judge Thokozile Masipa has recounted the known facts in the Oscar Pistorius murder trial, ahead of her verdict. The trial: Key prosecution moments Jump to media player As the world awaits a verdict in his trial, look back at key moments in the case against Oscar Pistorius, led by state prosecutor Gerrie Nel. The trial: Key defence moments Jump to media player As the world awaits a verdict in his trial, look back at some of the key moments in Oscar Pistorius's defence. Oscar Pistorius - in 60 seconds Jump to media player BBC News looks at key events in the life of Olympic and Paralympic athlete Oscar Pistorius - in 60 seconds. The verdict in the trial of Oscar Pistorius is yet to be revealed, after the judge adjourned the court in Pretoria unexpectedly. Earlier, Thokozile Masipa cleared the athlete of murdering his girlfriend Reeva Steenkamp in the early hours of Valentines Day 2013, saying the evidence showed he believed an intruder was inside the toilet. Mr Pistorius could still be found guilty of culpable homicide, which means he had no intention to kill but was negligent in his actions. The verdict would carry a maximum term of 15 years in prison.